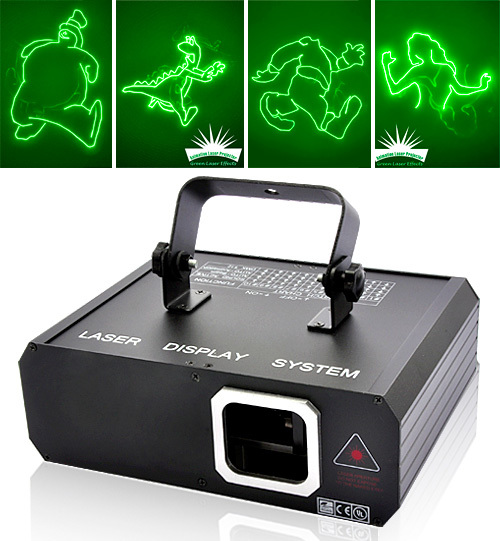 Animated Laser Projector | OhGizmo! By Andrew Liszewski on 11/22/10 • Leave a comment! Now you can finally bring home those laser-based animations that blew your mind at DisneyWorld or that last concert you went to with this laser projector from Chinavasion (~$110). It features a 70mw greeen laser that’s pre-programmed to draw one of several animated cartoons including such classics as the non-descript royalty-free version of Frosty the Snowman, a dinosaur fleeing extinction, a first year animation student’s headless walk cycle and the legless dancing girl. It can also project random patterns of squares, circles and lines if you just want to get trippy, and if you place it near a speaker the laser pattern can even react to sounds or music thanks to the projector’s built-in microphone.